← When Worlds Collide #113: Outpacing Tsunamis in the Indian Ocean: Are we ready? Last time the FIFA World Cup was approaching its climax in mid July 2010, I did my bit for interstellar cooperation (or conquest). If you’re an alien planning to invade the Earth, choose the day of the Cup Final, I said in an op-ed published on both sides of the Palk Strait. Chances are that our planet will offer little or no resistance, I predicted. Well, no aliens took my unsolicited advice (such spoilsports!). But if any such race is still interested, another chance comes up this Sunday, July 13. That’s when World Cup 2014 will culminate at Estádio Maracanã in Rio de Janeiro, Brazil. On that day, a sizeable proportion of the 7.2 billion members of the Earth’s dominant species – Homo sapiens, or humans — will be fully preoccupied with 22 able-bodied men chasing a little hollow sphere. Everything else will be placed on hold. It’s only a game, really, but what a game! The whole world holds its breath as the ‘titans of kick’ clash in the Cup Final. Starting on 12 June 2014 and played at a dozen venues across Brazil, this has been much more than a sporting tournament. Held once every four years, it’s the ultimate celebration of the world’s most popular sport. More popular than the Olympics, it demonstrates the sheer power of sports and media to bring together – momentarily, at least – the usually fragmented and squabbling humanity. Indeed, the exuberant spectators flocking Brazilian stadiums make up only a small part of the total audience following these games. Far more are following it on TV screens and numerous other devices all over the world. When a game is underway, it’s not just the fans of two participating nations who cheer or despair. For 90 scintillating minutes, human divisions like race, skin colour and literacy are blurred and forgotten. 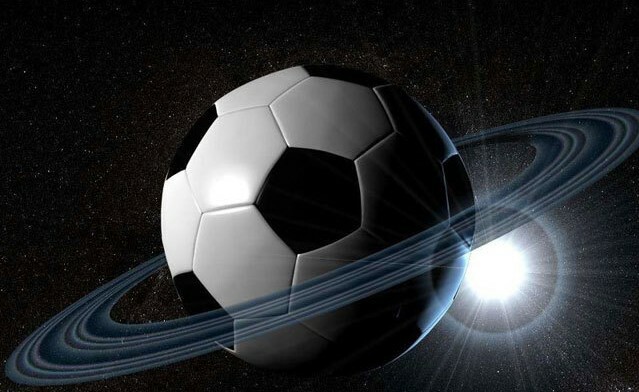 Thanks to the global connectivity provided by today’s instant telecommunications, we can all become citizens of Planet Football. To be honest, I’m not much of a football fan. But I love to watch people who watch the game…and how they do it. Projecting the game beyond its playing venues has come a long way. When the World Cup was first held in Uruguay in 1930, radio broadcasting was still in its infancy, and only a few privileged fans could share the games’ outcome by telephone. The first time broadcast television covered the World Cup was in 1954 when Switzerland hosted its 5th staging. Selected games were broadcast live (or delayed) in some European countries that could muster the complex logistics. Coverage expanded for the next staging, hosted by Sweden in 1958, with the European Broadcasting Union (EBU) getting into the act of negotiating rights. Again, only selected matches were broadcast. Four years later, the 1962 World Cup in Chile posed much bigger challenges to broadcasters outside Latin America. BBC TV, for example, could only carry it three days delayed: footage had to be rushed by air via the United States back to Britain. But BBC Radio covered the games live. With geostationary communications satellites being launched by the US and European countries from the mid 1960s, achieving live TV coverage across continents became easier – though it remained a costly exercise. The operative word here is ‘live’ – kick by kick, goal by goal, as it happens. Arthur C Clarke, who in 1945 first envisaged the use of geostationary satellites for global broadcasting, once suggested a neat phrase to sum up this remarkable phenomenon: How the World was One. And it’s no longer a passive family of couch potatoes. The web’s rise during the past two decades has effectively turned the whole world into a planetary scale stadium. Gone are the days when mass audiences simply listened to broadcast commentators annotating a match. Now, everyone can join the global conversation by tweeting or facebooking as play unfolds. The web started figuring in World Cup coverage more significantly in 2002, when Japan and South Korea – as co-hosts – created multiple websites and home pages for all participating teams. Narrowband Internet didn’t yet allow many to watch any real time video of games, but that eased by 2006 when broadband was rolling out. For the past month, the formula for unifying the Global Family seemed to be: international football + live broadcasts + live coverage via the web and mobile phones. Media and telecom companies have launched mobile applications, most of which offer live scores, news updates or interactive features. Some integrated with social media platforms like Facebook or Twitter. Brazil 2014 was predicted to be the World Cup where Twitter comes of age – and so far, the microblogging platform has lived up to expectations. By end June, Twitter reported more than 300 million tweets about the World Cup. In comparison, the 16 days of London Olympics in 2012 generated 150 million tweets. Witty remarks or visual memes – from winners and losers alike — can get re-tweeted (i.e. shared) hundreds or even thousands of times. The most popular hashtag (common denominator in tweets) has been #fifaworldcup, followed by #worldcup and #brazil. Meanwhile, Facebook reported more than a billion World Cup related posts, comments and likes generated by 220 million users from the time the tournament commenced on June 12 until June 29. Of course, with big money and power brokering involved, football is no longer just a game. The FIFA World Cup is the largest sporting event excepting the summer Olympics. In some respects, it is on par. With its 209 member associations from as many countries or territories, world federation of association football or FIFA (Fédération Internationale de Football Association) wields considerable political and economic clout. It is arguably more influential — and certainly better known — than the United Nations, which has 193 member states. The difference is largely in media outreach and embracing popular culture. FIFA and globalised football signifies the rise of ‘soft power’ in our always-connected information society. The World Cup in Brazil alone would generate around USD 4 billion in revenue for FIFA, 66% more than the last Cup. Half of this is expected to be profit, after paying all participating associations, players and winners. Television rights, commercial sponsorships and derivative products make up the largest share of FIFA’s income. Unsurprisingly, the governing body has been tainted by corruption scandals in recent times. 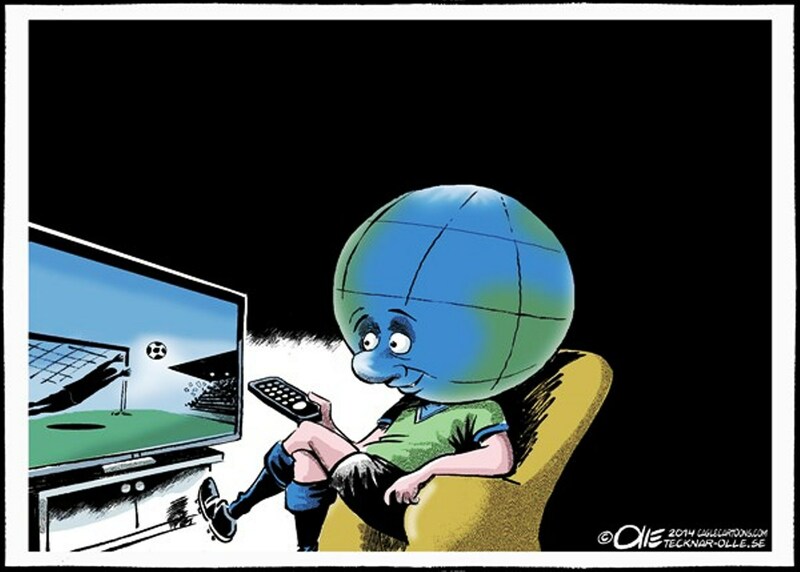 Whoever wins the World Cup, FIFA and the world’s media will be laughing all the way to their banks. This entry was posted in Current Affairs, ICT, Media, Social Media, Telecommunications, Television and tagged 1962 World Cup in Chile, alien planning to invade the Earth, Arthur C Clarke, Brazil, couch potatoes, Estádio Maracanã in Rio de Janeiro, Facebook, FIFA (Fédération Internationale de Football Association), FIFA World Cup, geostationary communications satellites, How the World Was One, instant telecommunications, lanetary scale stadium, live broadcasts, mobile phones, Narrowband Internet, Olympics, Planet Football, social media, Twitter, Uruguay 1930, World Cup 2014. Bookmark the permalink.